Surge Protection - Not Just for Computers! Should I buy a Convection Oven? "Alexa, pre-heat the oven to three-fifty. Alexa, set freezer temperature to -3 degrees." The future is upon us. 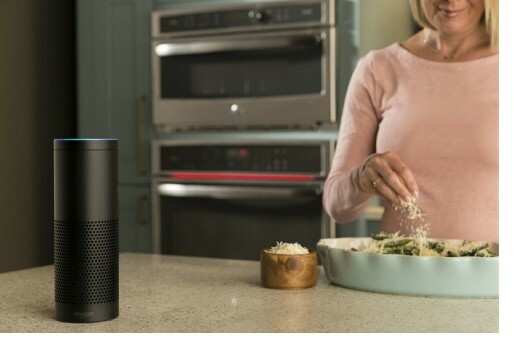 Products such as Amazon's Echo allow homeowners to interact with an ever-increasing amount of WiFi enabled devices through voice-activated commands. Echo is a smart speaker that responds to the name Alexa. Play music, create to-do lists, set alarms, stream podcasts, play audiobooks, provide weather, traffic and other real time information are just some of the things Echo can do. It can also control smart devices using itself as a home automation hub. Appliance manufacturer's such as GE Appliance, Electrolux, Samsung and LG are incorporating WiFi into their appliances to leverage this new technology. GE has created an entire WiFi enabled line of appliances that will respond to dozens of voice-activated commands. Why speak to your stove when you can just push a button? Simple is not a word that comes to mind when describing some of today's large appliance control panels. Appliances configured to respond to an array of voice-activated commands hold the promise of a user-friendly home environment. Physical control panels may become nothing more than backup to voice activation. Voice activation will also allow those with physical challenges to expand their reach of comfort and control with in the home. One thing is certain. Wireless innovation will continue to creep into more of our daily lives. Much of it will have no practical purpose. WiFi enabled appliances we can control with simple voice commands may be one area where practicality and technology team up to improve our standard of living.